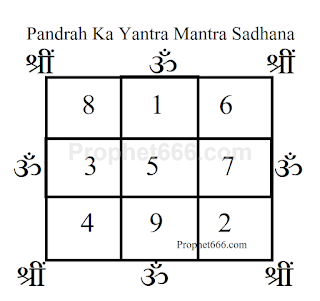 The steps and guidelines mentioned below are prescribed for the 15 Ka Yantra Mantra Sadhana. 1] The 15 Ka Yantra Mantra Prayog should be started during the period of either the Ravi Pushya, Ravi Hast, Ravi Mool or Guru Pushya Yogas or anytime during the most auspicious period of the festival of Diwali. 2] The 15 Ka Yantra Mantra Prayog is for a total of 12 days and each day the practitioner has to draw 1000 Yantras on white paper using either red or black colored ink. 3] The practitioner should wear white colored clothes and sit on a white colored sitting mat for practicing this Yantra Prayog. 4] The Yantras should be drawn when the practitioner is predominantly breathing through the left nostril or Chandra Swar in the Hindi language. 5] Each day, after drawing the 1000, 15 Ka Yantras, the practitioner should keep them in-front of him on a Puja Board covered with a white cloth and light Dhoop and Diya and chant the Mantra given below 1000 times using his preferred counting rosary, including a Rudraksha Japa Mala. 6] The same procedure should be followed daily for the 12 days of the Sadhana and all the prepared Yantras should be collected each day and kept in a clean and pure place in the house. 7] Then, after 12 days, the practitioner can make the 15 Ka Yantra on a Bhojpatra using any pointed wooden stick and the paste of Ashtagandha as the ink or he can get the 15 Ka Yantra made on gold or silver. 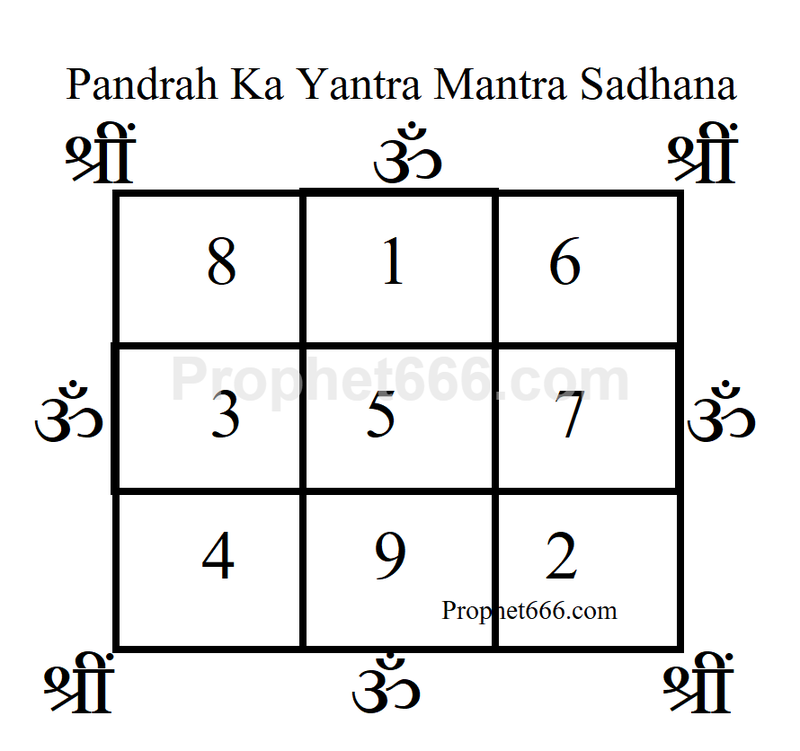 8] This Yantra, can be kept in the Puja-Ghar, Altar or even on the body for attracting all-round auspiciousness, progress in love, getting married to a suitable person, protection from enemies, illness and disease, dangers and evil energies, getting material items, money and wealth. 9] The 12,000 Yantras, which have been drawn on paper should be collectively immersed in a flowing water body. Guidelines- The practitioner should wear white colored clothes throughout this 12 days Yantra Sadhana. During the 12 days Sadhana, the should maintain celibacy, control anger and avoid sour, spicy or sweet food and have meals only once a day and sleep on the ground.